Produced by Microsoft, as a Surface-series Windows 8.1 tablet, the Microsoft Surface Pro 3 was announced on May 20, 2014 and the first models are planned to be released on June 20, 2014 in the Canada and U.S. A designed Type Cover and a battery-powered Bluetooth pen are included as new accessories. The most attractive place is the 12-inch display which is bigger than its predecessor, but this one is thinner and lighter. Besides, the batter life can last for 9 hours of web browsing and even 1 year in sleep mode. According to the official announcement, almost by the end of August 2014, the Surface Pro 3 will be available in 26 additional markets. With only 800g weight, everyone can't wait to play games or videos on it when travelling or on the move. Of course, HD or 4K ultra video files are highly suggested in order to have an ultimate visual experience. In order to play the high definition videos, usually, you have to figure out the supported players among thousands of software and even install different video players over and over. Frustratingly, you will turn to experts: what kind of video converter for surface pro 3 is really helpful? With extraordinary features, MacX Video Converter Pro is welcomed by many Mac users who want to convert videos. More specifically, with 370+ video/audio codecs, it is capable of converting various video formats like AVCHD, MPEG2 HD Video, MPEG-2 TS HD Video, Blu-ray Video, AVI, MPEG, WMV, MP4, M4V, FLV and more to general video such as MP4, AVC, AVI, WMV, MKV, MPEG1, MPEG2, RM, etc. At the same time, it can convert videos to Pads or mobile phones like Microsoft Surface Pro 2, Samsung, iPhone, iPad etc. If you own this Mac video converter for surface pro 3, you will never worry about spending much time on finding out the suitable video player and install it on Surface Pro 3 for different video formats. Before converting video for Surface Pro 3, you should download Surface Pro 3 video converter and install it on your Mac with several clicks. Launch this software and input your video file by clicking "Add Video" button on the main interface. 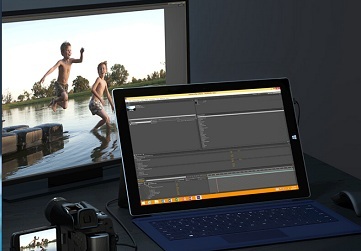 Choose the output format for Surface Pro 3 converting video in the sub-category of "Device Profile". Tips: With constantly updating preset profiles, it provides the latest devices for you which will be showed in the proper sub-category once released just like iPhone 5s/5c has already in Apple device category. Select the destination folder for the target video file by hitting "Browse". Clicking "RUN" button to start converting. 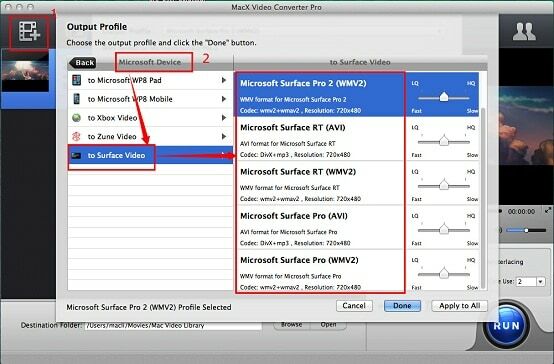 After several simple clicks on your Mac, you can obtain available video by video converter for Surface Pro 3. At the same time, you are allowed to download YouTube video for playback on Surface, make slideshow or edit video by this video converter. By the way, this Mac video converter for Surface Pro 3 is supported Mac OS X Leopard, Snow Leopard, Lion, Mountain Lion, Mavericks.